Can Wisdom Teeth Cause Crowding of the Front Teeth? Have you noticed your front teeth looking more crowded than they used to? There’s got to be a reason they’re suddenly moving around — and actually, your front tooth crowding can be caused by your wisdom teeth. These third molars erupt between ages 15 and 24 and often put pressure on the surrounding teeth, making them move around when you least expect it. Your oral surgeon in Houston recommends the extraction of problematic wisdom teeth. 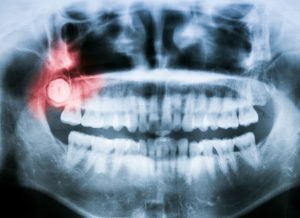 How can the wisdom teeth affect the teeth in the front of your smile? By creating something of a domino effect in the mouth. When there is not enough room for the third molars to erupt without issue — and there rarely is — these teeth are likely to come in crooked or at an angle. They then put consistent force on surrounding teeth. Even the teeth in the front of the mouth may be affected by the excess pressure. Whether it’s a lone wisdom tooth or all four that are present beneath the gum line, the third molars can cause serious issues in an otherwise healthy mouth. Impaction, or the partial eruption of the tooth, may cause infection, tooth crowding, and severe pain. An impacted wisdom tooth should be removed as soon as possible to protect the rest of your smile. How can you tell if you have one or more problematic wisdom teeth? There are some warning signs to look out for. Do not hesitate to contact your dentist if you suspect you are dealing with the side effects of an impacted or infected wisdom tooth. Its prompt extraction will help you to avoid a tooth abscess, gum disease, front tooth crowding, and other dental and oral issues. While your general dentist may be qualified to perform wisdom tooth extractions in-office, is that really the best choice for your case? A general dentist spends most of the day doing checkups, fillings, and maybe a root canal from time to time. An oral surgeon, on the other hand, spends the majority of their time performing wisdom tooth extractions and other complex procedures. You and your dentist can discuss the details of your extraction. If he or she does not feel comfortable performing the procedure, you will be referred to an oral surgeon. You may also decide to visit an oral surgeon in Houston on your own. Oral surgeons are experts in wisdom tooth extraction and also offer dedicated surgical facilities for the procedure. If you prefer to have a specialized professional perform the procedure, do not hesitate to contact your Houston oral surgeon at Piney Point OMS. Dr. Koo and Dr. Weil complete wisdom tooth extractions from the comfort of our state-of-the-art office. Request an appointment today! Comments Off on Can Wisdom Teeth Cause Crowding of the Front Teeth?